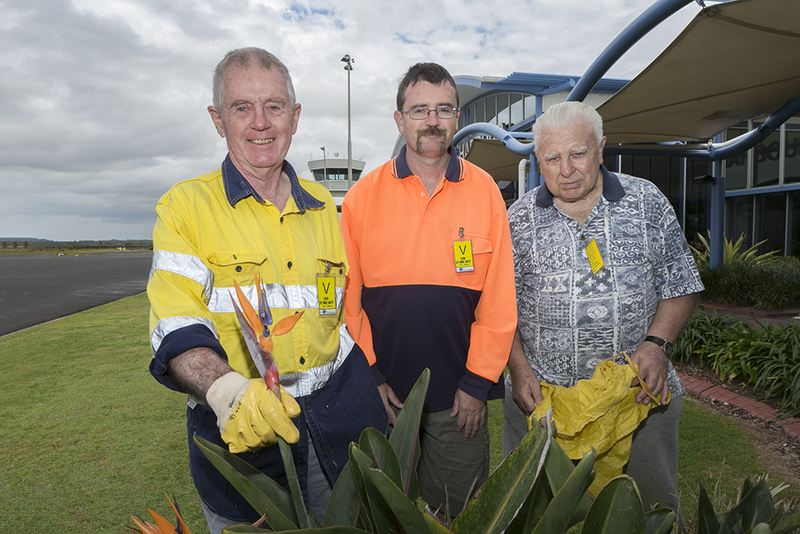 A cheerful CHGC crew at the Coffs Harbour Airport. It was in 1996 that CHGC were asked for assistance with artistic contribution and an on-going maintenance commitment to the air-side garden at the Coffs Harbour Airport. A committee was formed to design and maintain the air-side gardens under the guidance of Rhona Brooks. The weeding and trimming of this garden is still carried out by Garden Club members the first Wednesday of the month. Over the last twenty-one years there have been some wonderful Team Leaders including - Rhona Brooks, Jack Lawson and now, Peter Kimber. 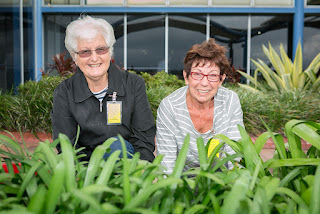 The garden installed in 1996 was quite expansive and brimful with colourful annuals and perennial plantings, which did require a lot of maintenance. 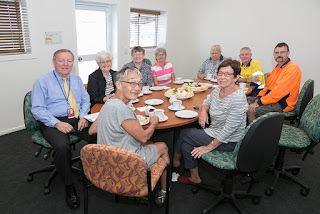 This was a huge commitment from the club which was ably fulfilled by enthusiastically committed members. The airport has expanded exponentially with the growth of Coffs Harbour. So it was inevitable that changes would happen as the airport catered to these changes. So during April/May of 2000 the original garden was uprooted when extensions to the airport terminal were undertaken. 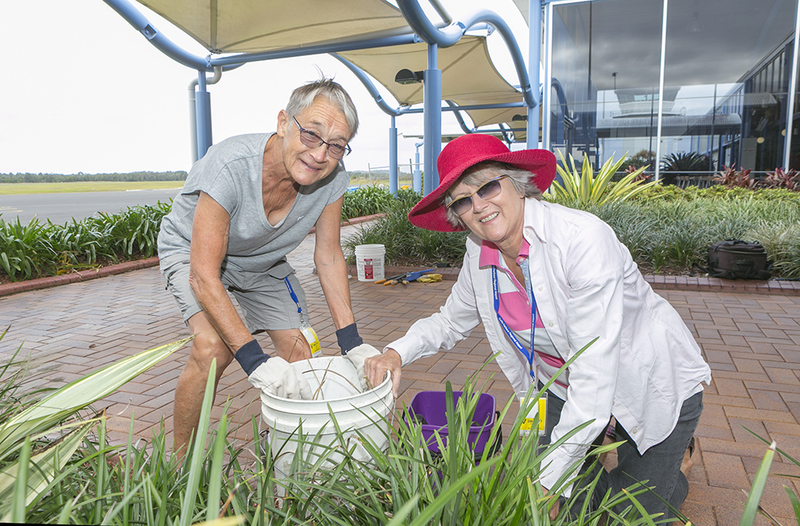 All the plant material was potted up and dispatched to the Coffs Harbour City Council Nursery for reuse, while construction progressed. A new design was hatched by the gardening team with the plants supplied by Coffs Harbour City Council Nursery. 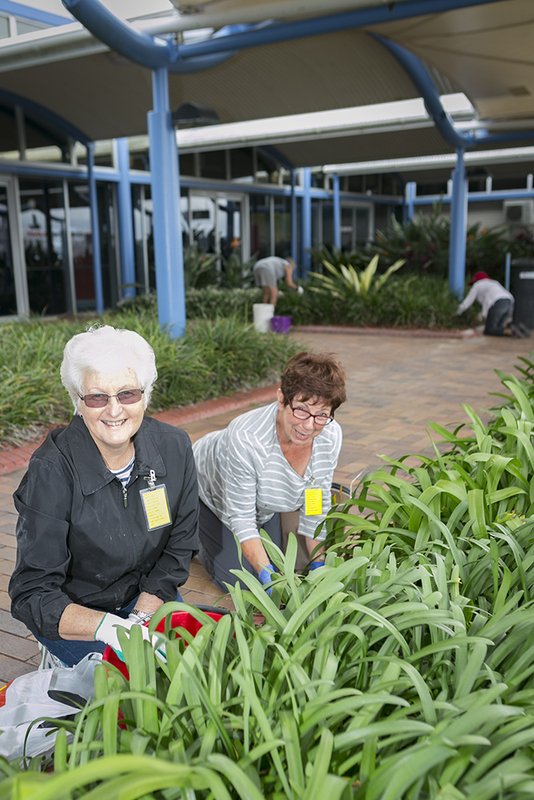 It was in October 2000 when the extensions were complete that re-planting was undertaken by Garden Club members. 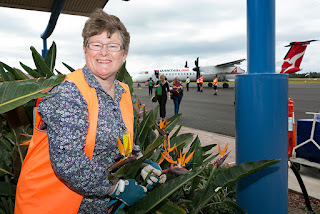 The new Airport garden contained some of the saved plants from the previous garden and also new selections. The garden took shape as a more formal and narrower garden, keeping plantings low and using minimum variety and colour palette. Philodendron 'Zanadu' were planted along the path edge backing up to the glass in the viewing area. However these were removed some years later when it was felt that they obscured the view (especially for children) of approaching or departing aircraft - after all, that is part of the excitement of going to an airport, actually seeing the aircraft arriving and leaving! Bearing in mind that this garden has quite a hostile environment due to (especially) wind with aircraft movements, over time it has been found that some of the plant selections just didn't work. Some of the taller cordylines were being flogged with the wind and as a consequence, always looked rather shabby. These 'non-performers' have been removed over the years and been replaced by hardy plants, for example liriope, giant variegated mondo and strelitizia. Cycads (which are ancient seed plants dating back over 200 million years) were chosen for their resilience in earlier plantings. Whilst they did stand the test of time in regard to the elements, over the years these cycads were prone to a number of problems: blue butterfly attacks, scale and yellowing leaves which were not at all attractive. 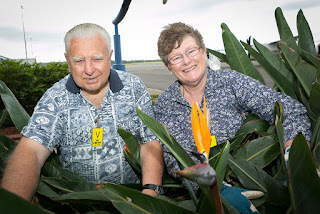 Coupled with their huge growth, their spiny stems and also obscuring the view of the runway, it was felt that these should also 'get the chop', this time with a chain saw! This monthly maintenance work is conducted while normal aircraft/passenger movement occurs. The only thing we have to be mindful of is not to actually engage any passengers in conversation or come into physical contact with them. All our work is done with a supervisor on hand to guide us where we can work during the passenger/aircraft movements. 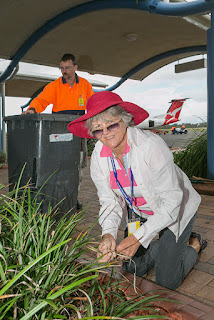 It has to be said we do get some strange 'looks' when passengers see us folk tending the gardens at times. the crew to an appreciation morning tea. 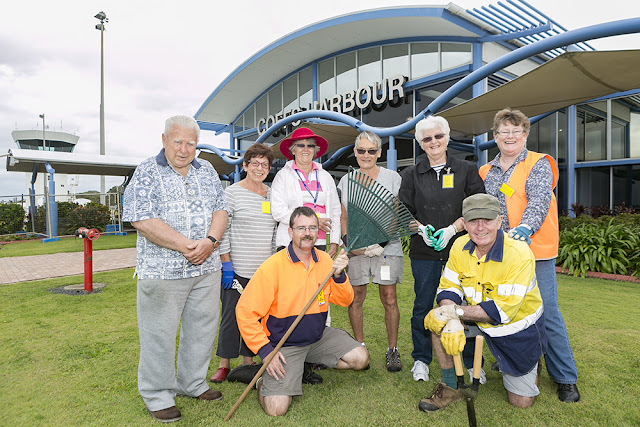 The Coffs Harbour Regional Airport is not sitting back and resting on their laurels... With over 400,000 passenger movements per annum the airport is still developing and fast! Currently there is a $6.5 million upgrade to the runway apron area to accommodate more aircraft and termination area extensions. A difficult task bearing in mind that 'the show must go on' so there is a lot of work undertaken overnight to achieve work deadlines and still operate in a safe and appealing environment for workers and passengers. Airport Manager Dennis Martin outlines the details of these plans. 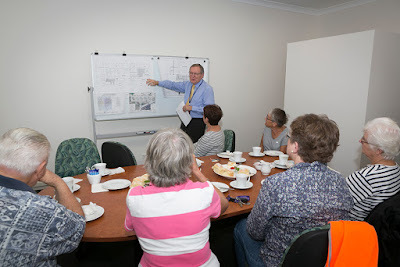 Dennis pointed out that the airport has been working on a specific growth strategy for several years now, which involved the development of detailed business proposals and extensive negotiations with airline partners and it is wonderful to see positive outcomes as a result. 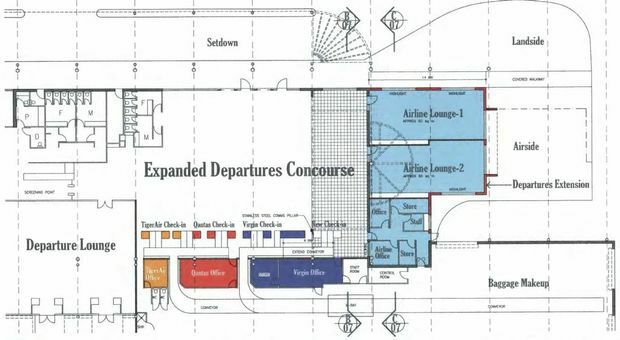 The proposed development would transform the airport's main terminal building including construction of two airport lounges, upgraded toilet facilities and expansion to the arrivals gate and departures concourse. 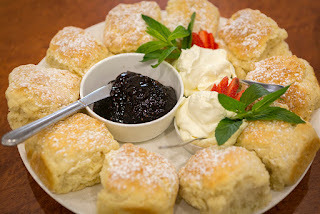 Dennis pointed out that the scones at our morning tea had been cooked on site that morning. They were absolutely delicious, the team made short work of them! 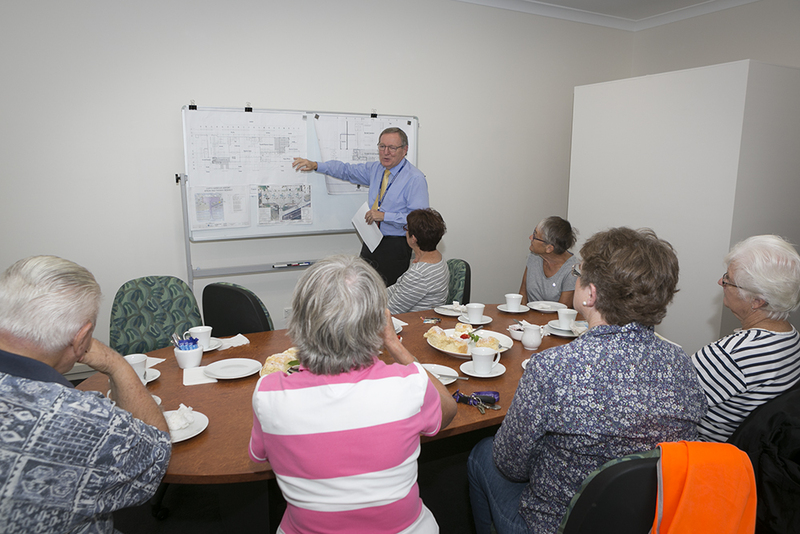 CHGC appreciate the General Manager Dennis Martin for his explanation of the developments for the airport precinct. There will be major changes to the existing garden area and CHGC members look forward to further challenges in the development and maintenance to these areas.